Unique design conserves time and cost. Sterlitech Corporation launched Rocker Scientific’s MF Series Magnetic Filter Holders as an expansion of its comprehensive vacuum filtration line. Users seeking improved work flow at a competitive price point will discover the traditional problems encountered in lab filtration, from managing an unstable apparatus to optimizing versatility, are resolved in the unique design features of these funnels. These can be used in place of Pall brand magnetic filter funnels. Constructed of Polyethersulfone (PES) material, the MF Series Filter Holders utilize a magnetic coupling between funnel and base, which holds the system together securely and allows for single handed operation along with rapid membrane filter changes. The robust chemical compatibility of the PES housing and its ability to withstand autoclaving make these holders ideal for a range of applications, from microbiological testing to prefiltration of chemical solutions. According to Sterlitech President Mark Spatz, “The magnetic seal technology applied here is an asset to customers, allowing for effective filtration with less work. These versatile holders are an affordable and practical alternative to glass”. Every step in the filtration process is enhanced using this technology. The built-in membrane guide and bevel design enable easy positioning and retrieval of the filter. Both 300 ml and 500 ml funnels are conveniently graduated in 50 mL increments to aid in volume measurement while pouring. 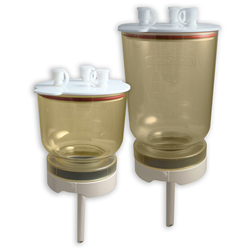 Compatible hose barb and sealing gaskets allow for connection to a variety of receiving flasks and storage bottles. This series is easily adopted into varying filtration set-ups from single use with a receiving flask to 3 or 6 place manifolds for maximum throughput. Located in Kent, Washington USA, Sterlitech is an ISO 9001:2015 certified corporation. Its founders have over 90 years of combined experience in membrane and microfiltration technology. Since 2001, the company has developed a strong global brand recognition serving a vast number of end markets in over 125 countries. Our aim is to equip scientists, entrepreneurs, and visionaries with the means to transform ideas into reality.